Being a chart reduced in size sometime in the past caution must be observed in comparing the extant chart to any others as we do not know what is missing. It is too easy to assume it would look like its predecessors as a planisphere, because of preconceived ideas formulated in the past decades, but that is at least a starting point we have until this analysis is completed and in fact is carried out in a manner that previous researchers have ignored. 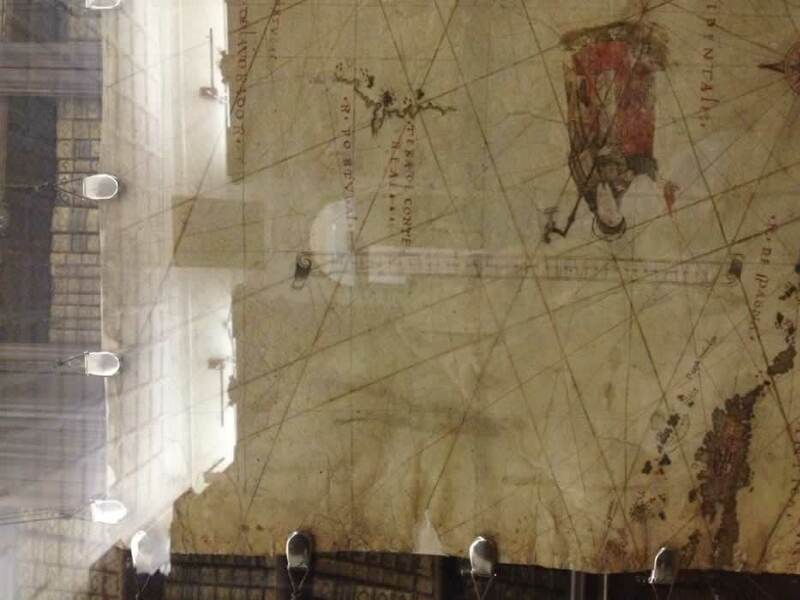 Commencing in 1500AD the first extant planisphere, the La Cosa chart is noted as being followed by the Cantino Planisphere, 1502AD and then either the FANO chart or the Caverio planisphere. Dates for the Caverio chart vary slightly but affect the outcome of any research as it is either, just preceding, the same year, or the year after the FANO chart. Then one of the next extant charts is generally given as the Pesaro Chart, among others. 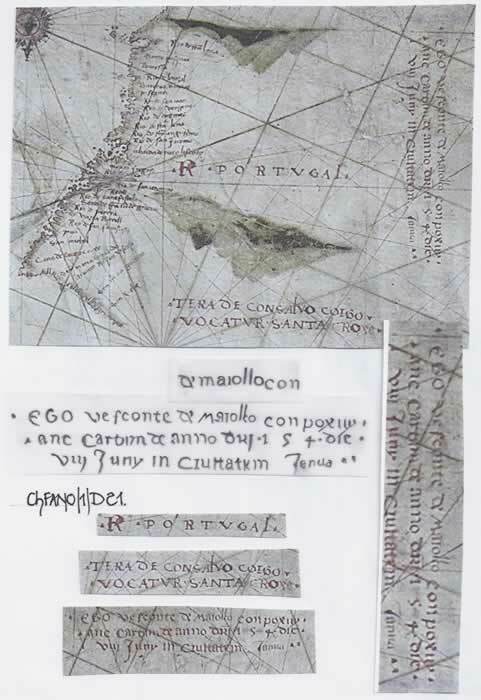 From the Cantino Planisphere, which itself is a “cobbled together copy” of an original Portuguese “Padrao” chart, researchers have stated that each subsequent chart is a “copy” of the Cantino chart or in a completely off-hand manner a “copy” of a similar chart without specifying where or when this “mystery” chart or charts were produced. COPY; to write, print, engrave, construct, draw, paint etc., according to an original: to model after, as a work or composition, by drawing, painting, writing, printing, engraving, and the like; to transcribe; to imitate; sometimes followed by “out”. A thing made in imitation of another specifically, in “fine arts”, the imitation or likeness of any picture, statue, figure, draught, or the like. Thus I would expect anything that is a copy of another to be at least 95% accurate. 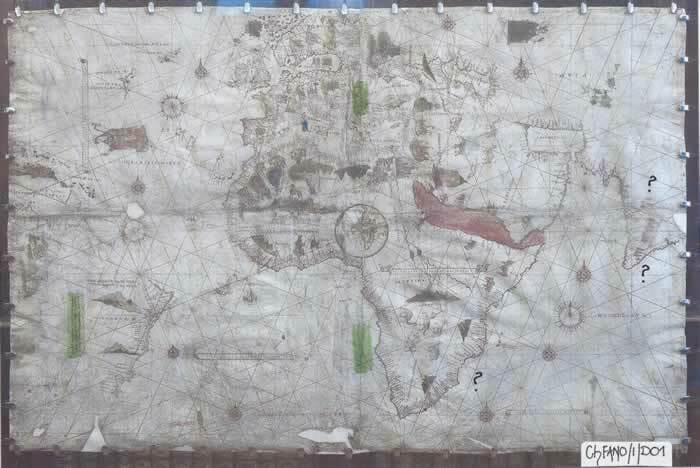 “McIntosh- Maggiolo Fano, 2003-2010, preface; The main thesis of this thought experiment is that the depictions of the old world especially the seas, peninsulas, and place names of the littoral of the Indian Ocean, Red Sea, Persian Gulf, Arabian Sea and Bay of Bengal on the Vesconte Maggiolo World map of 1504 and the Caverio, Kuntsman No 2, Egerton ms 2803 and Pesaro manuscript world maps are derived not from multiple introductions of Portuguese cartography into Italian cartography, but by the introduction of that Old World image in a single event, that is the arrival of the Cantino Planisphere in Genoa November 1502 and its subsequent dissemination through traditional manuscript copying processes, particularly via the highly influential copy made by Nocolay de Caverio. I see now that, though the main thesis maybe correct, the evidence presented by this research may not be particularly strong and my suggestions remain only a suggestion” End quote. At this point a comparative study of the Cantino and Caverio charts, as text ChCAN/1+ChCAV/1 (ChCAN/2+ChCAV/2) clearly illustrates they are in draughting terms a mile apart; they are not one being the “copy” of the other and in fact it can be clearly shown that “Cantino” is two different charts “cobbled” together and “Caverio” is a poorly drawn pastiche of probably three charts. Thus it is important not to burden the FANO chart with preconceived ideas from a visual assessment but carefully look at its internal structure and what it does not in fact illustrate. When the Biblioteca Comunale Federiciana sent me a digital copy of the chart which was capable of enlargement via the picture manager programme, my first task was to look very carefully at the parchment, its draughtsmanship for the wind rose, the coastal forms and the method of joining the various sheets which make up the whole chart for any discrepancies which may affect the accuracy of my investigation. 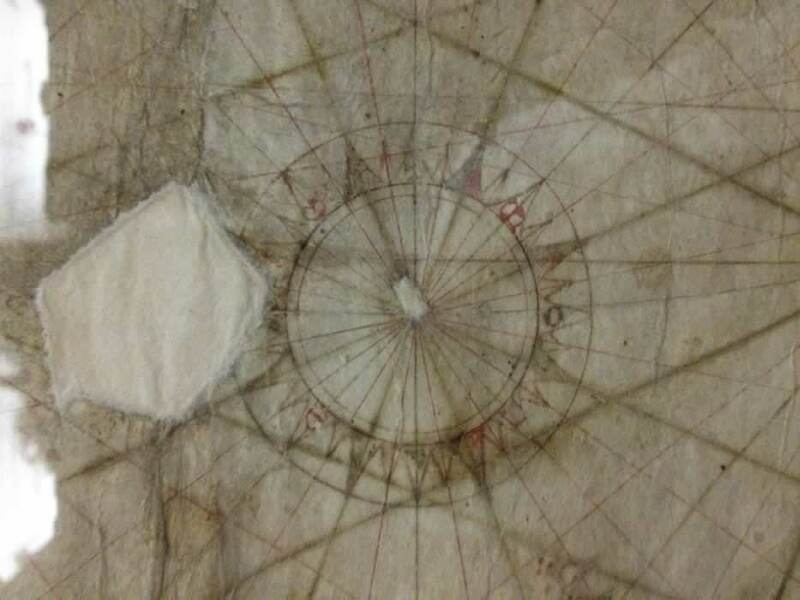 I found two small areas where the wind rose lines did not join accurately, as marked on diagram ChFANO/1/D01 along the vertical centre line. I suggest that photo 15 is looked at as it clearly shows the problem discussed. They are in fact of limited problems on the one hand, but clearly indicate a mis-alignment. 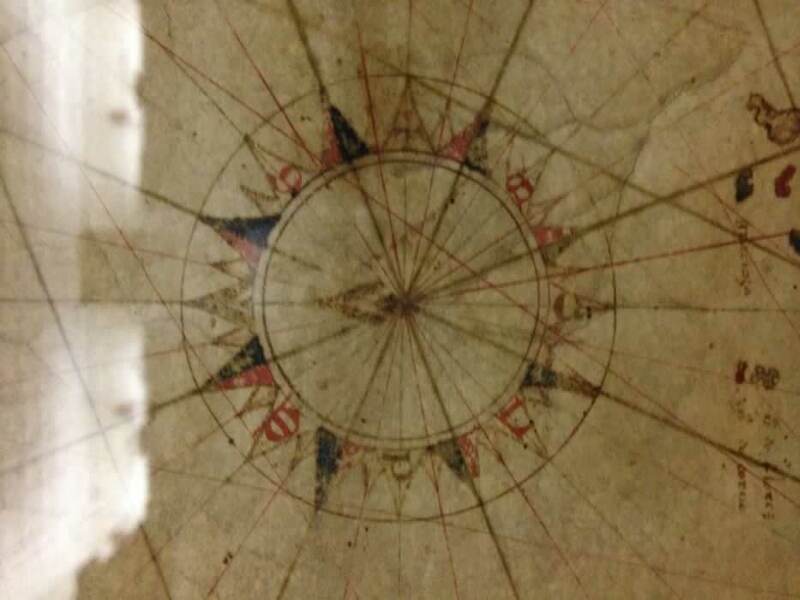 Thus when I measured the overall size of the wind rose across “node” points and via the graticule I was unhappy with the accuracy and concluded immediately that a circle to form the wind rose had not been used but that it had all been set out mathematically and geometrically. That of course was a mammoth task as the cartographer or draughtsman had chosen to use all 32 points of the compass and not the more traditional 16 points and the simple geometric ratio of 92 units split into 35/30/20/7 units, which is fully explained in my texts ChWR/1+ChWR/2. 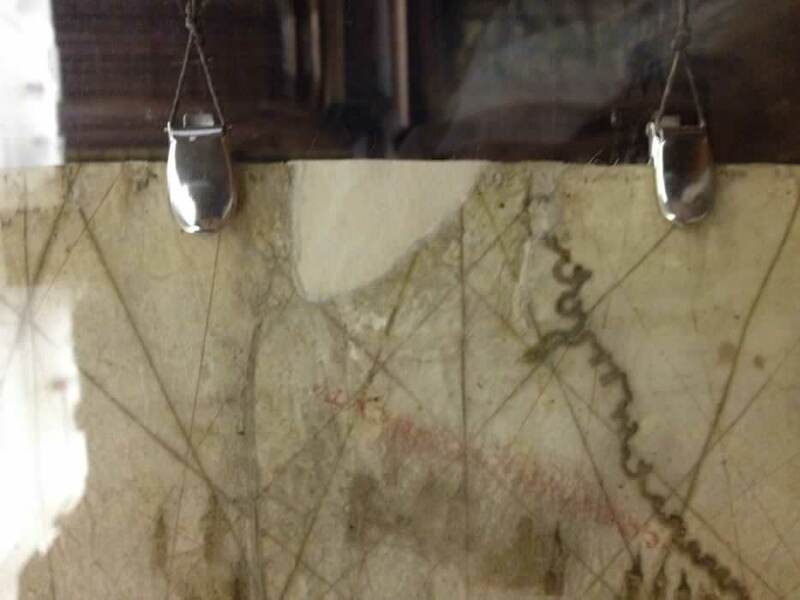 At this stage in the research it was mid-winter and a trip to Fano was thus impractical and I approached the Biblioteca Comunale Federiciana for assistance. I will state plainly and openly that there is not a single Biblioteca or University Library that has been so willing to answer every request with immediate effect and I can only say they really did go the extra mile for me. I have had excellent assistance from several libraries in Europe and the USA, but FANO is exceptional and I sincerely thank them. 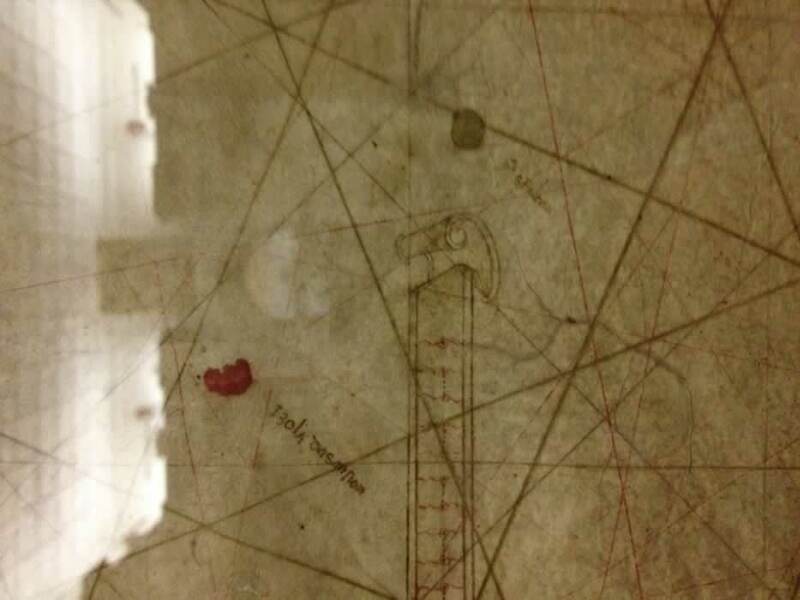 Thus when I asked for precise measurements to be taken from the chart to establish the fault lines and enable the drawing of a wind rose graticule as first conceived by the draughtsman I was sent appropriate measurements, including the extant chart overall size. 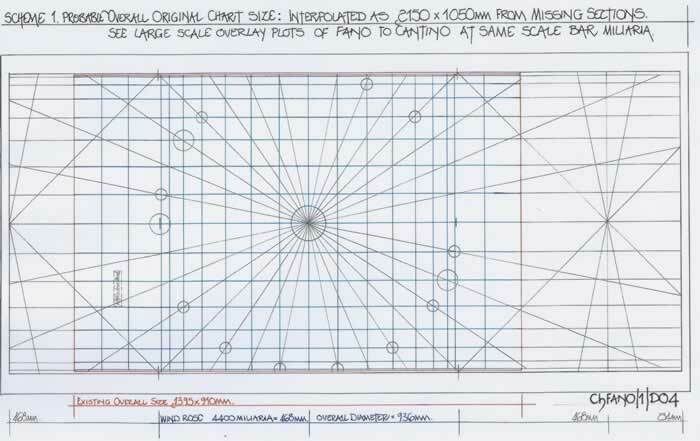 I have appended four measurements to the diagram as supplied by “Fano” which amply illustrate my concerns regarding the overall measurements accuracy, but in studying them I found they actually provide a very acceptable overall diameter for the “hidden circle” of 936mm which I have subsequently used in the reconstructions of the possible original graticules. 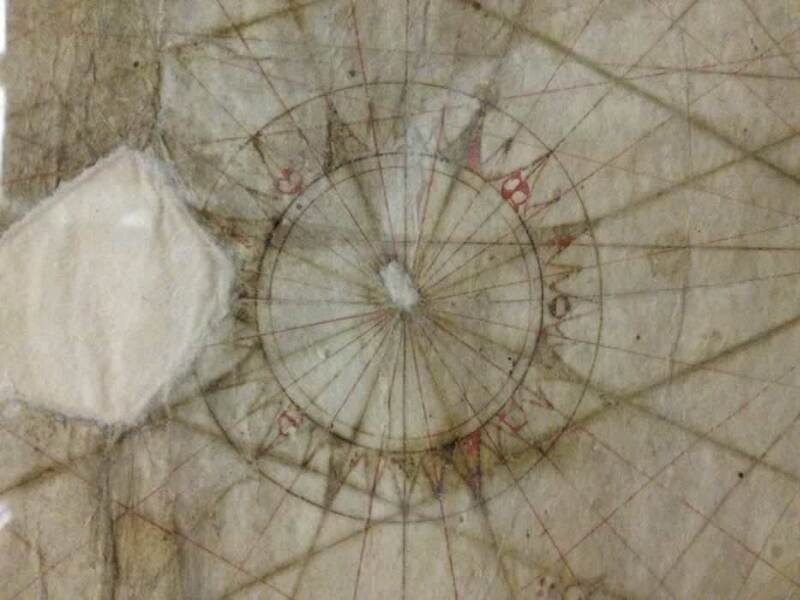 By utilizing the horizontal centre line with its overall 936mm wind rose diameter measurement I was able to quantify the whole extant chart using the use the overall chart measurements supplied by “Fano” of 1395 x 910mm. The calculated/measured segments agreed and thus I was able to determine that in all probability the east and west sides were cut along extant vertical wind rose lines, particularly as the western measurements were a matching set of graticules to the main centre and the eastern side was a correct graticule but was set out differently. 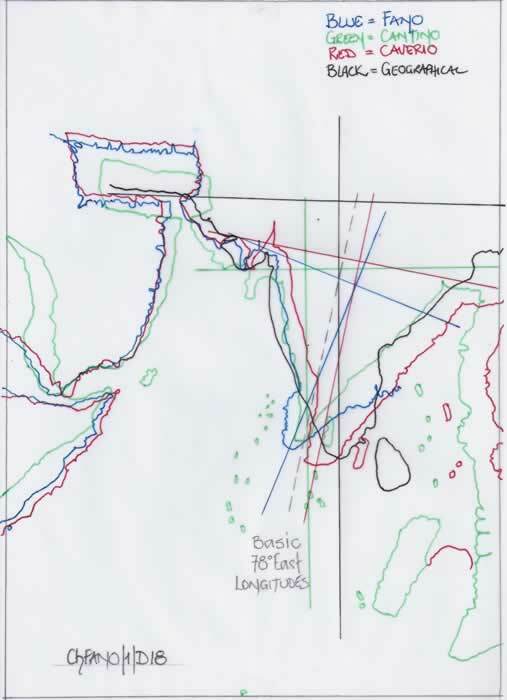 Therefore that opened the investigation into several possibilities; firstly the graticule was not symmetrical and thus the chart need not be either, secondly, the eastern section was perhaps not part of a symmetrical setting out but the graticule changed to suit either a perceived difference or different origination of the data used to draw the overall chart. And. Thirdly the chart as seen now was very similar to its original size. SCHEME 1: A POSSIBLE OVERALL ORIGINAL CHART? 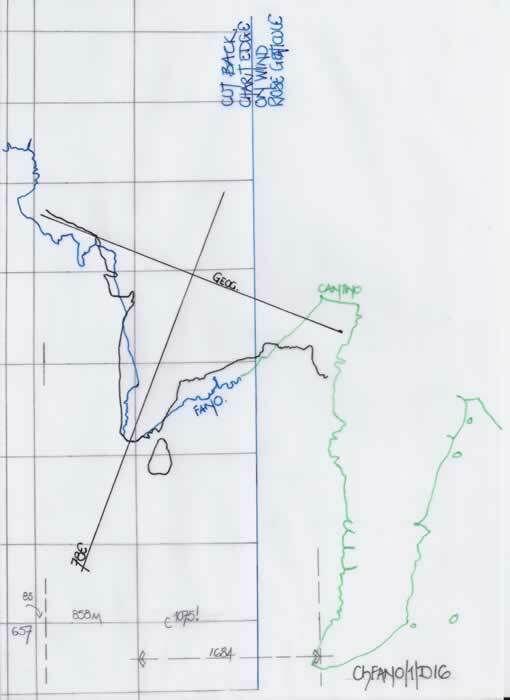 Evaluating the western edge extension was quite simple in that a half wind rose, 4400 miliaria/468mm fitted quite perfectly with the logic of the existing graticule to the cut edge and also allowed for the missing chart section to be adequately encompassed as the later large scale diagrams ChFANO/1 D10 to D13 clearly illustrate. 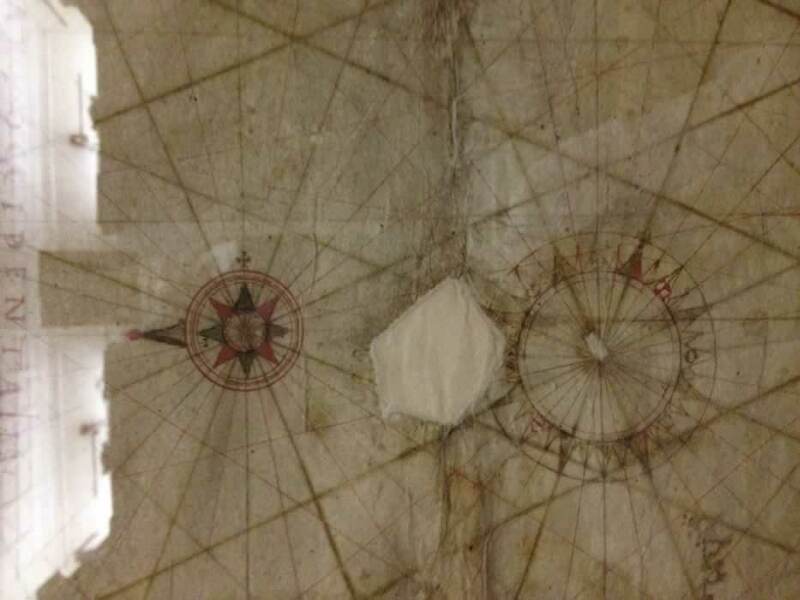 However the eastern extension was not able to be assessed by the repetition of the wind rose graticule as it appeared to be a geometrical setting out and thus required a geometrical solution. 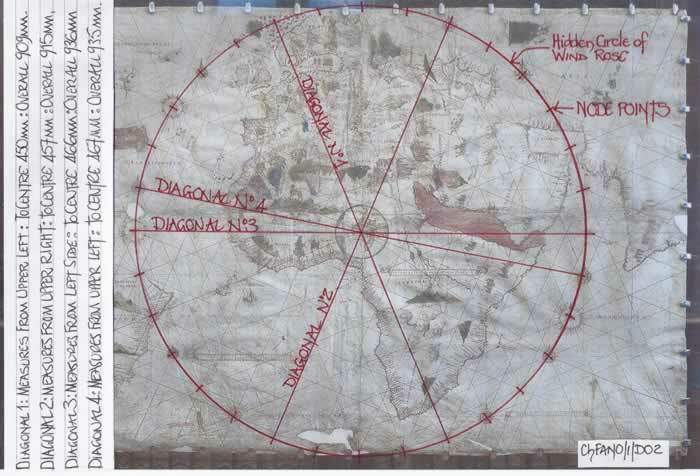 Geometrically it fell into place when having assessed the large scale comparison plots which follow later, it was obvious a “Radius” and a “Half Radius”, that is 4400 miliaria + 2200 miliaria which would complete the chart if in fact it was ever drawn as such. Therefore the overall wind rose in this example is simply (4 x 468mm) + (234mm) and probably 2106mm overall. 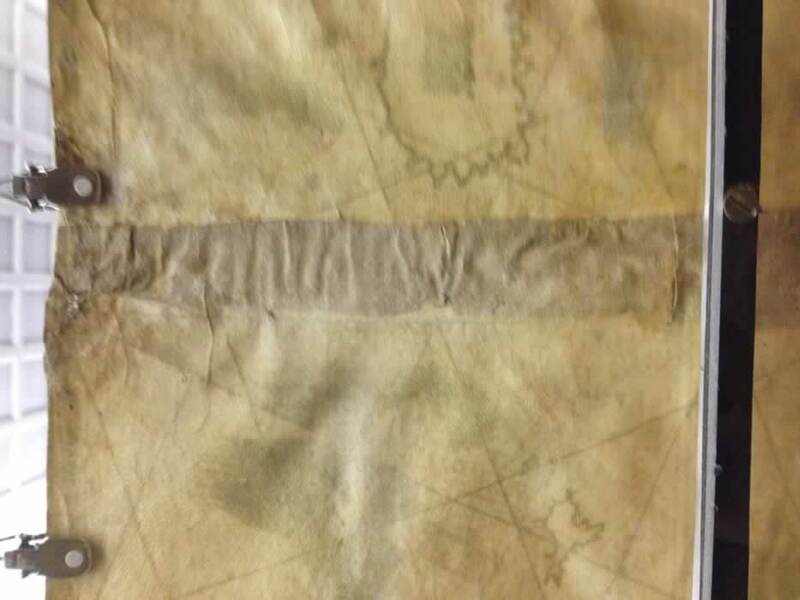 Thus the overall parchment could have been 2150mm or thereabouts in length. 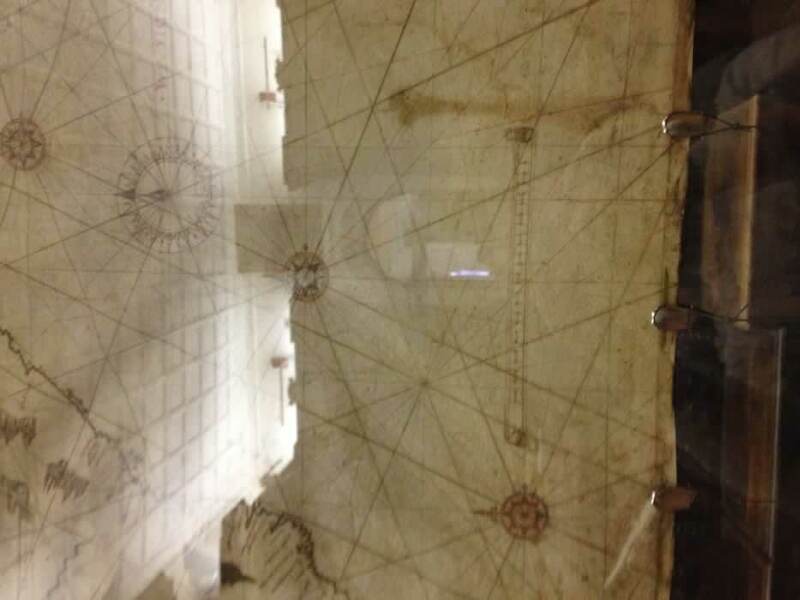 The Cantino Planisphere is at present 2200 x 1050mm. 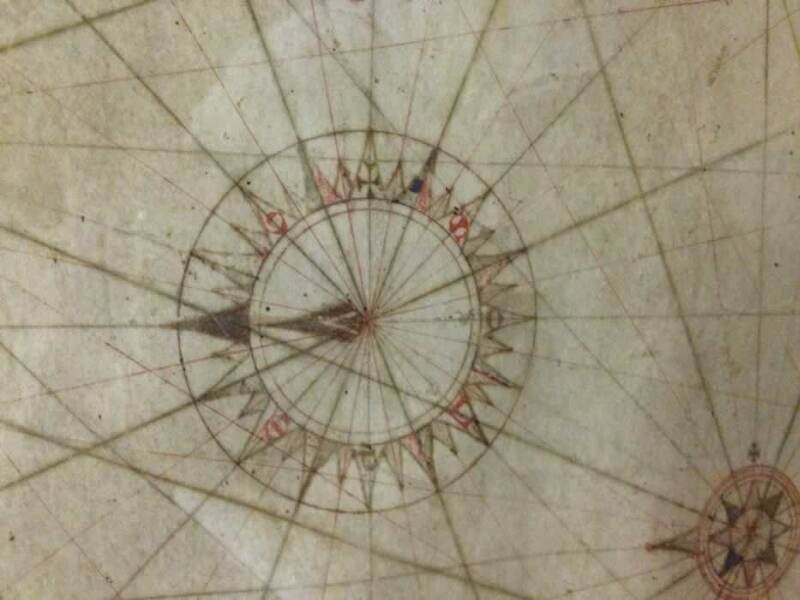 The latitudinal distance is assessed in a similar manner in that the wind rose is 936mm and by allowing 57mm north/south we have an overall measurement of 1050mm. But do not be fooled as that measurement is to the reduced size Cantino Planisphere and we do not know when it was so reduced. SCHEME 2: A SYMMETRICAL OVERALL ORIGINAL CHART? If you studied the first diagram, the chart as extant (D01) it should have been apparent that the eastern part of the chart was missing some features and the Indian Sub-continent is drawn decidedly skewed clockwise. That raised the spectre in my mind that if India was so skewed and the Malay Peninsula followed then it would show on the chart edge. That it did not led to two possibilities being considered; firstly the east coast of India was continued north-easterly out of all proportion to the west coast, but placed the Indus/Ganges correctly by latitude and thus the Malay Peninsula was further to the east and would not appear or, secondly the chart was curtailed near this cut line and thus the Malay Peninsula etc were only partially included, if at all. 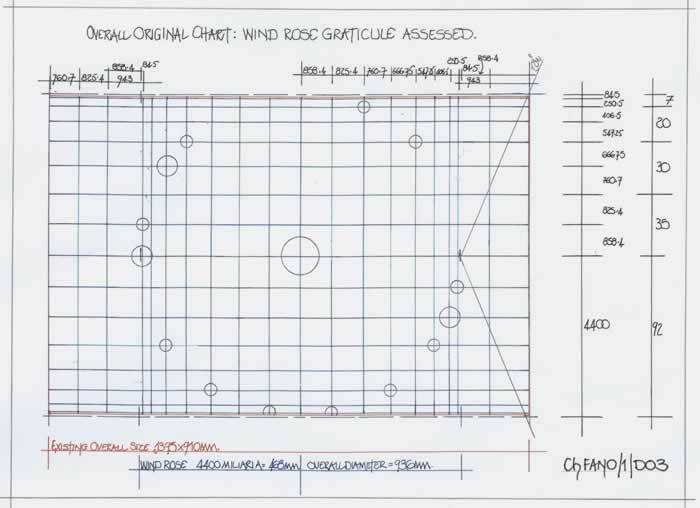 Hence the Scheme 2 wind rose plot is basically 4 x 468mm or two overall wind rose graticules. SCHEME 3: WAS THE CHART PRACTICALLY THE SIZE IT IS NOW? There is no diagram for Scheme 3 as it is basically the eastern section as expanded and noted for schemes 1 and 2 as it is well measured and obviously part of the main wind rose system. The eastern area is however an enigma and is likely to have been just a little larger than the chart as the information there-on is sparse and not possibly up to date. Thus I conclude the chart is incomplete and its final size indeterminate. Obviously either Scheme 1 or Scheme 2 is a possibility and I doubt there will be a solution to the conundrum as Scheme 3 is possibly the more likely. But, I seriously think this requires an answer by researchers who have just accepted with no evidence the chart is as “Cantino”, when there is no proof or indication of the FANO charts original size. As usual I indicate the probable distance measures utilized on the chart taken from the Miliaria scale bars. That they are miliaria is easily proven by the distance from the Equator to Iberia at 43N, where they are each 75 units, the wrongly assumed miliaria latitudinal measure when in fact it is actually 75 Roman Miles. 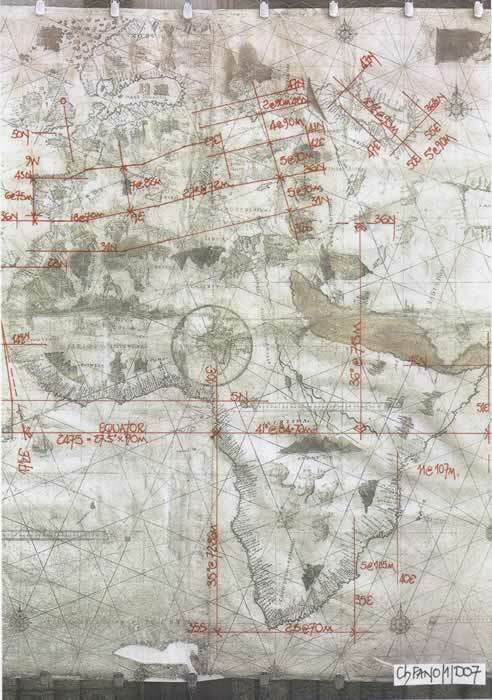 The longitudinal setting out in the western section is as awry as shown on the 1500LaCosa, 1502Cantino and 1505Caverio charts. Curiously though both the Equator and Tropic lines have been omitted as has the Line of Demarcation, although, I have interpolated them onto the chart and confirmed the position via the Cantino chart overlay which follows later. 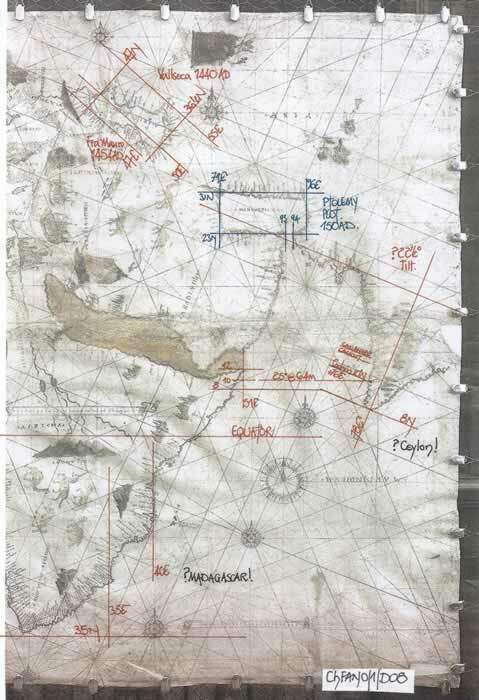 At this stage as previously commented upon I did wonder if the chart was finished, as these would be de rigueur for any planisphere. Please note that these three diagrams over lap and can be joined to form one chart. 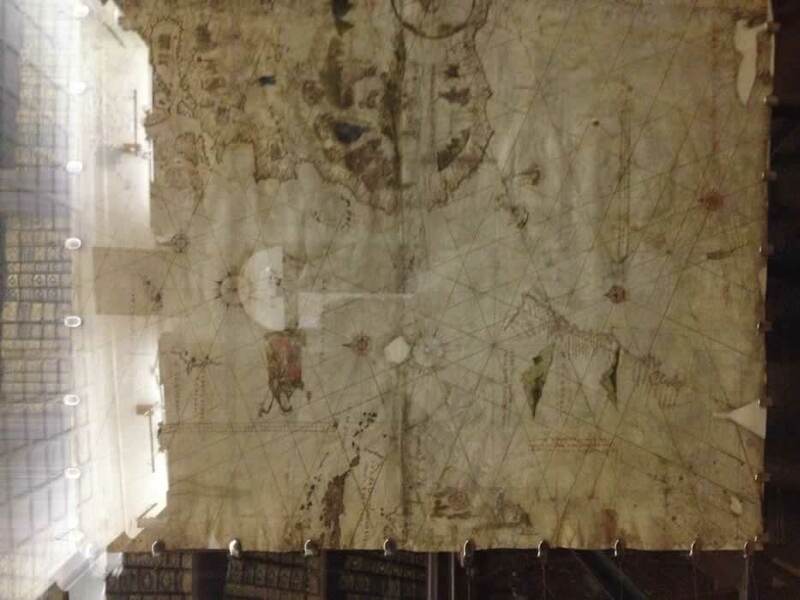 The central section, Europe and Africa is well drawn and follows previous Portolan Charts. It obviously suffers from the then impossible task of equating distances longitudinally given that a degree of longitude at the Equator is 90 miliaria and at 36N/35S it is 72 miliaria and thus the north south sections can never properly align. 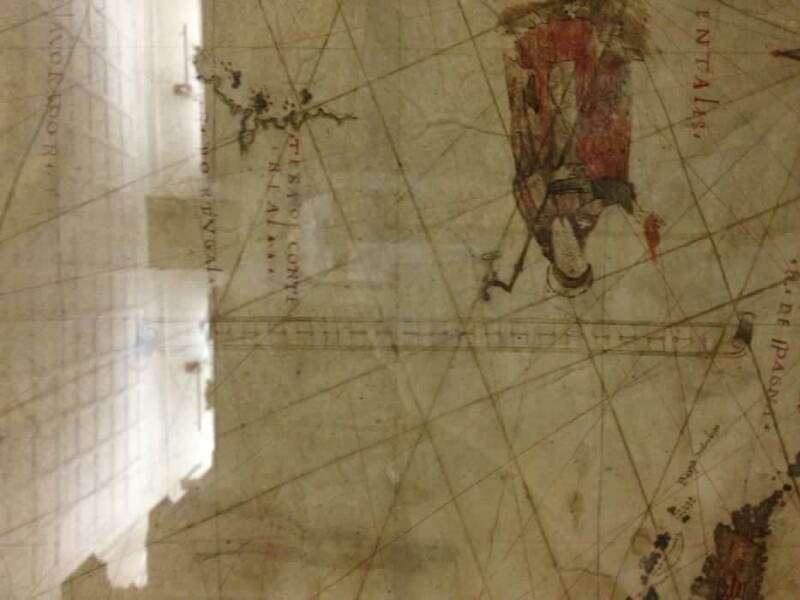 The addition of the Caspian Sea, first seen on the Vallseca 1440 chart and then on the Fra Mauro 1454 World Map is surprising to say the least, but it follows their format and is thus a gratuitous extra. An attempt has been made to align the Red Sea to the Mediterranean Sea basin in its correct position, but of course the distance measures 90/72 make a mockery of the profile. On the third or eastern section, the Persian Gulf is a rendition of the Ptolemaic plot of 150AD and has been drawn to the north of its geographical position no doubt influenced by the slewing of the Indian Sub-continent, which if drawn correctly would not only move eastwards but reduce the northing of the Persian Gulf. 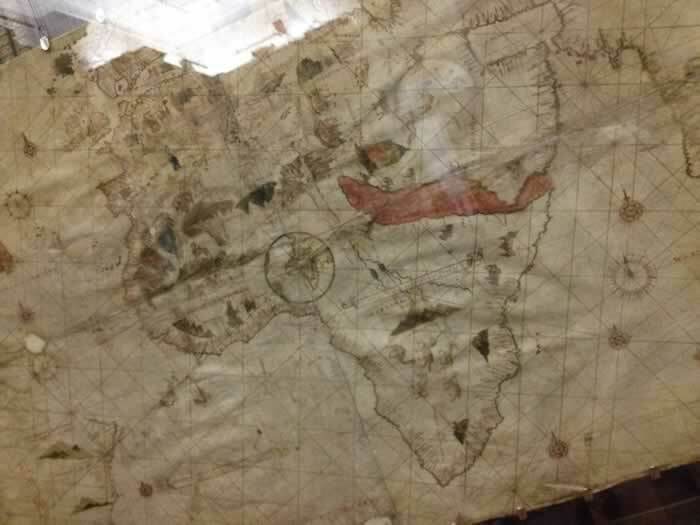 But here we perhaps witness the possibility that the chart is unfinished in that Ceylon and Madagascar as well as a myriad of Islands are missing from the Indian Ocean. The Indian Sub-continent is too well drawn for this to be an omission from the data available and points to the possibility of a desire to finish the chart quickly (or produce a saleable copy) and thus it may not extend to the east very far past the cut edge. In comparing charts which previous researchers have adamantly proclaimed are copies of each other, I have commenced with a simple overlay of the “FANO” chart onto the “Cantino” chart with equal scale bars. 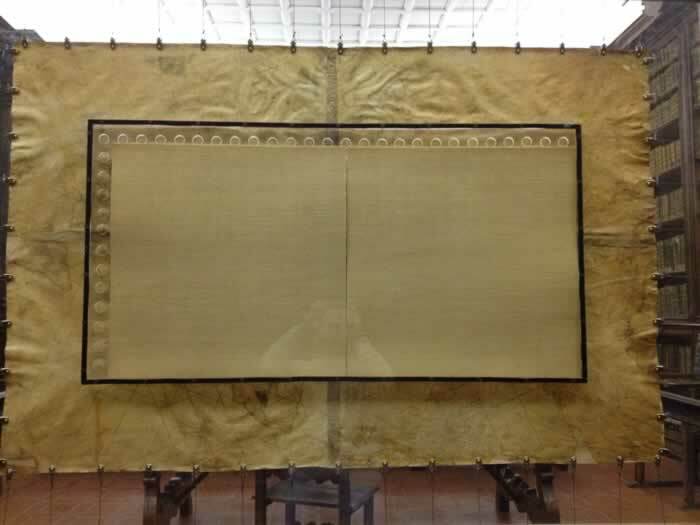 But, being at such a small scale differences are in fact lessened, even though it clearly shows that the “Fano” chart is not a copy of the “Cantino” chart, but is in fact a singularly drawn chart. The next section has the large scale proof. Please note that diagrams D10 and D11 are in fact capable of being joined as they partly overlay each other and that is the same for diagrams D12 and D13. 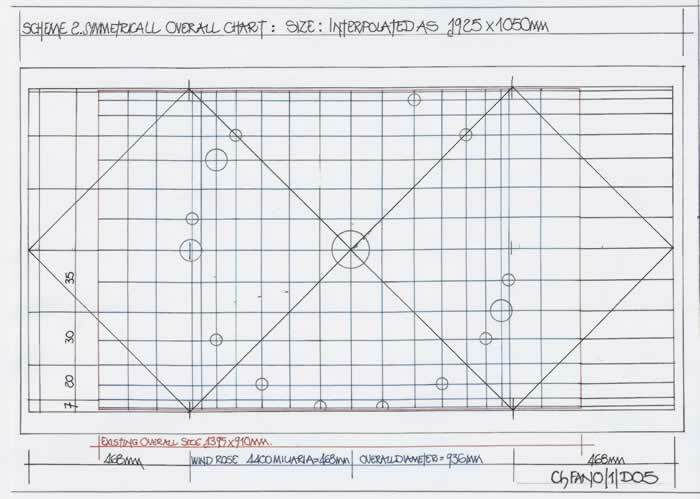 I have chosen to align each chart, at the same scale, in such a form that the parts that have meaning when the statement “copy” is made can be assessed. 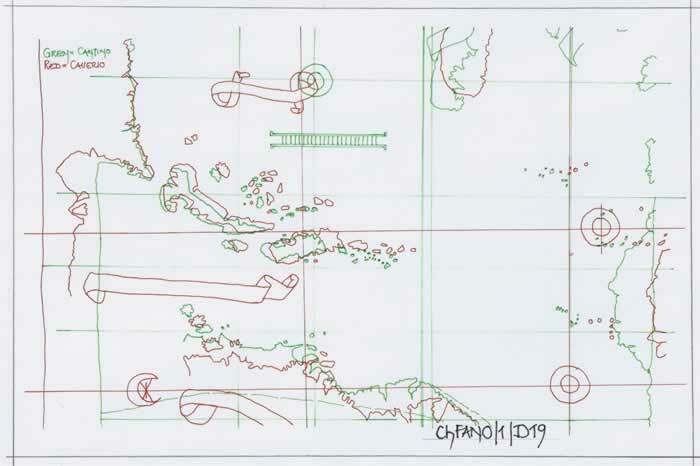 Hence diagram ChFANO/1/D10 aligns Hispaniola and Africa longitudinally to gauge the so-called “copy”. 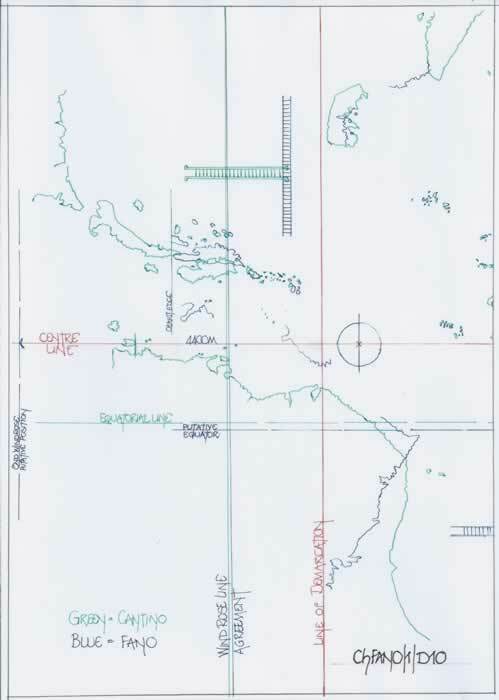 That they do not align successfully but the putative Equatorial lines are acceptable and the Line of Demarcation can be understood as previously surmised on the “FANO” chart. 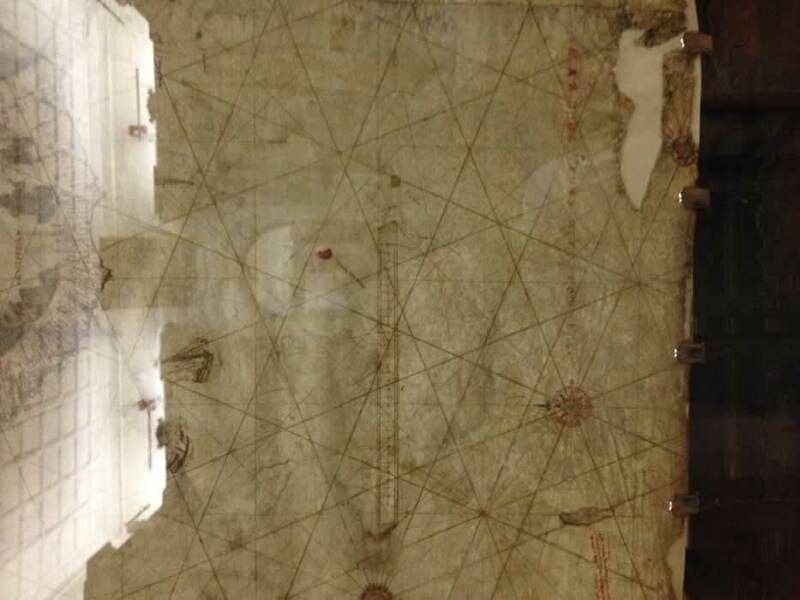 The western second wind rose missing from the “FANO” chart has been indicated to illustrate that had the “Fano” chart had drawn Cuba/Florida then it was credibly encompassed on the chart. 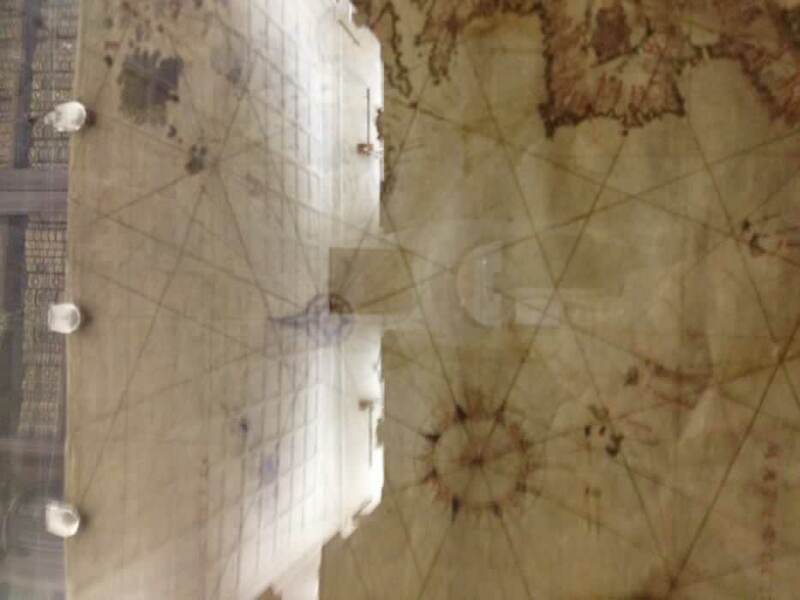 By aligning the coasts from the Pillars of Hercules or Strait of Gibraltar, latitudinally and longitudinally it can clearly be seen that the Mediterranean Sea basin is accurately drawn on both charts as it should be having been drawn accurately for 200 years on Portolan charts. But that in no way indicates copying, merely long term knowledge being put to excellent usage and a large number of charts available to formulate this section. 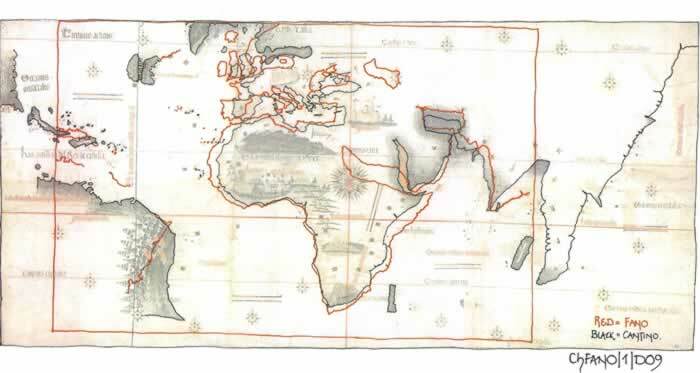 The fact that Africa then extends easterly to enlarge the continent indicates it is not a copy merely a newly drawn chart of a similar geographical area. 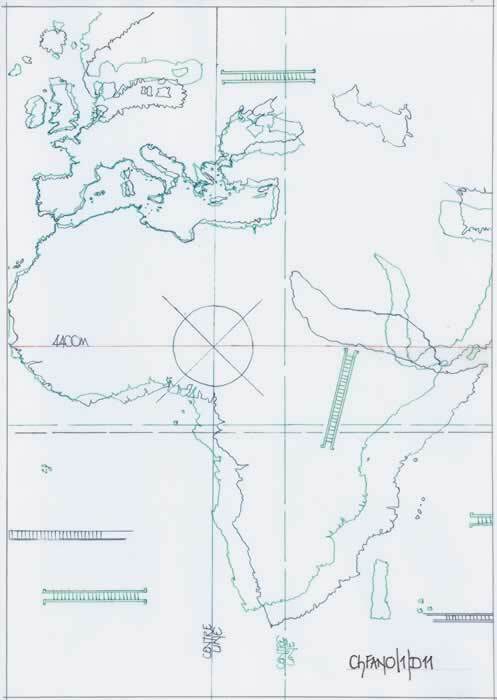 On this section of the comparative chart I have aligned the Horn of Africa, 51E/12N, which moves Europe and Africa westerly and begins to partially align the Persian Gulf and Indian Sub-continents. Similarities exist, but it is playing with maps to make an alignment happen not scientific research. Either it is all a copy or a fragmented presentation. 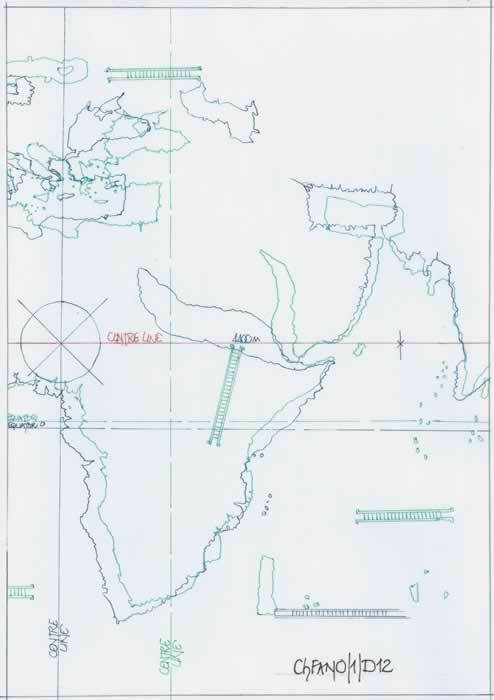 This section has been included, set out for INDIA from the preceding section but mainly drawn to illustrate the “FANO” chart with both possible wind rose schemes noted by positioning the vertical end lines for each section and the possible Cantino Chart interface. 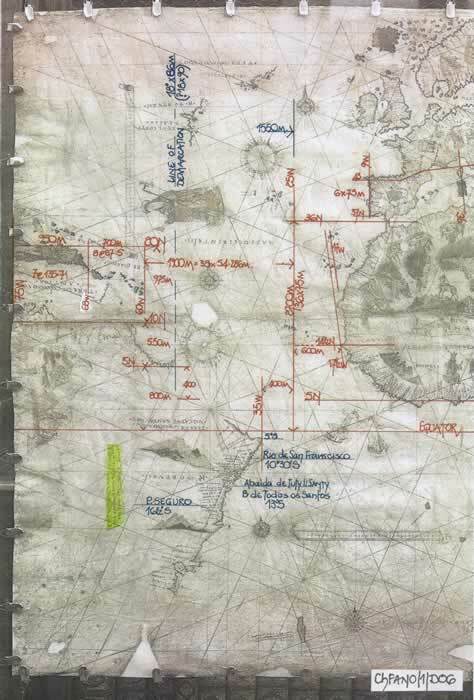 The complete Caverio Chart is available on the BnF Gallica website and is here-in included for illustration purposes only. It was fully discussed in the previous texts noted. 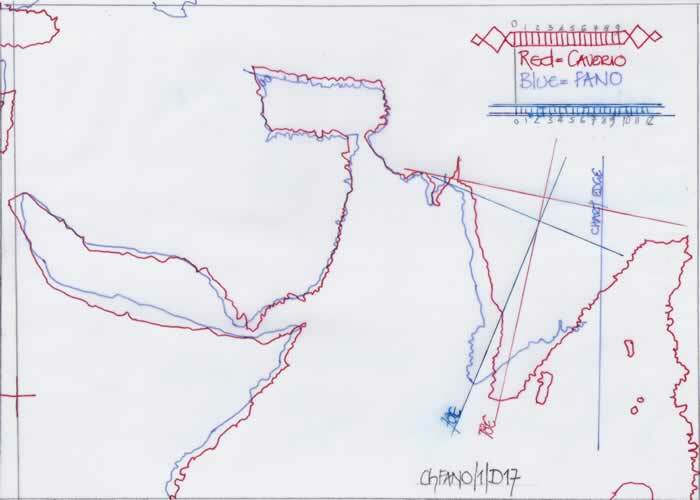 On diagram ChFANO/1/D15 I have aligned the “FANO” and “Caverio” charts via Africa and the centre lines and this clearly indicates the poor quality of “Caverio’s” European section. 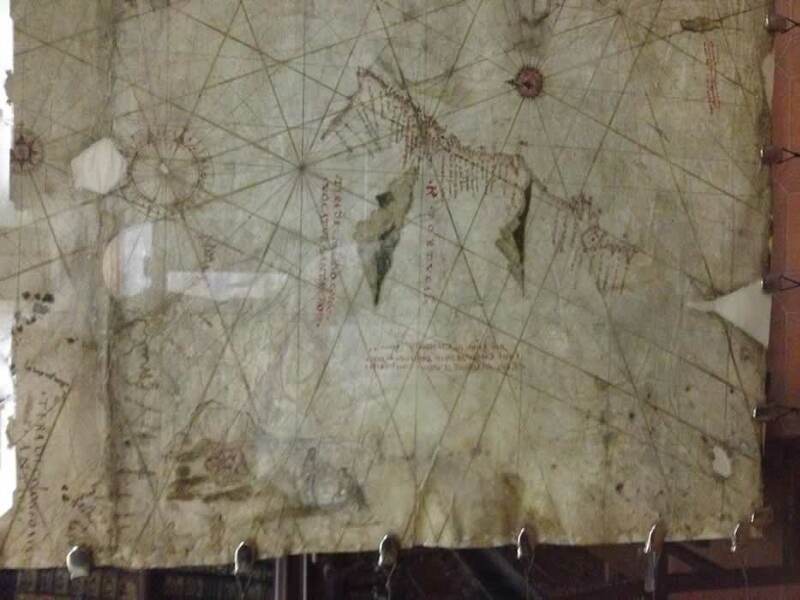 But perhaps it also illustrates that although I believe “Caverio” worked firstly in Lisbon before returning to Genoa, both the “FANO” and “Caverio” charts owe their existence to one of the missing charts, so miserly accepted by other researchers. These two charts obviously indicate that and may have gleaned information from one and the same. 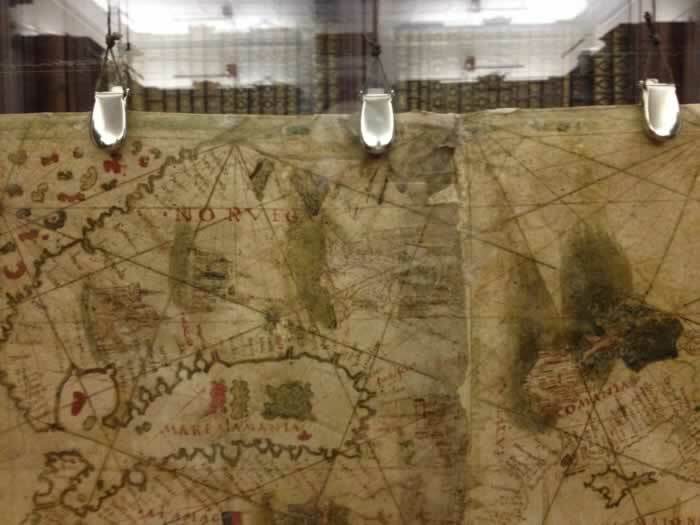 That chart or charts was certainly not the Cantino Planisphere, and certainly not in November 1502, but as I have opined in the previous texts “Cantino” was not a singular chart and the atelier obviously made copies at the same time particularly to have a record chart for future usage. 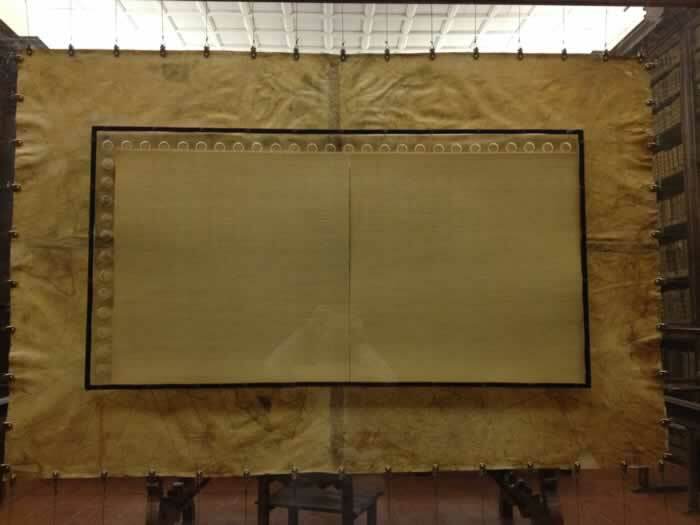 I also do not consider that any other draughtsperson had the time to copy the Cantino chart when it arrived in Genoa. I have commenced with an overlay, ChFANO/1/D16, of a combination of the charts by FANO/Cantino with the geographical plot of India appended. This illustrates that the Malay Peninsula and Taprobane/Sumatra could have been on the missing section even though the Indian Sub-continent is slewed through 22 ½ degrees clockwise. That is a complete ¼ wind and could be the result of following a wind rose line alignment incorrectly. 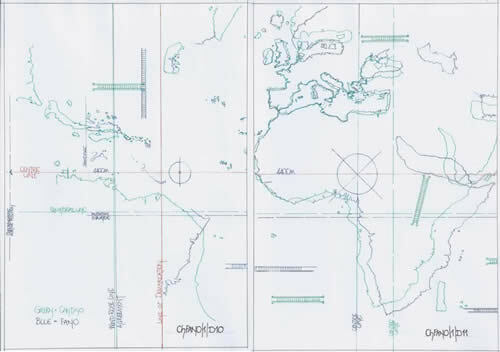 The second plot, ChFANO/1/D17 has the FANO/Caverio charts aligned at the Horn of Africa and the Persian Gulf and their dissimilar setting out angle. Finally on diagram ChFANO/1/D18 I have combined all three charts with the geographical plot set correctly north/south and based upon the ChFANO/1/D17 alignment. Thus it is quite apparent that the Cantino Planisphere north/south alignment could be interpreted as geographical from the longitudinal alignment across the Indus/Ganges latitudes, but it could also be interpreted as having those incorrect and as I surmised in the “Cantino” text with the southern tip of India drawn far to the west. In effect the dotted 78E longitude is a fairer representation of the Cantino plot. 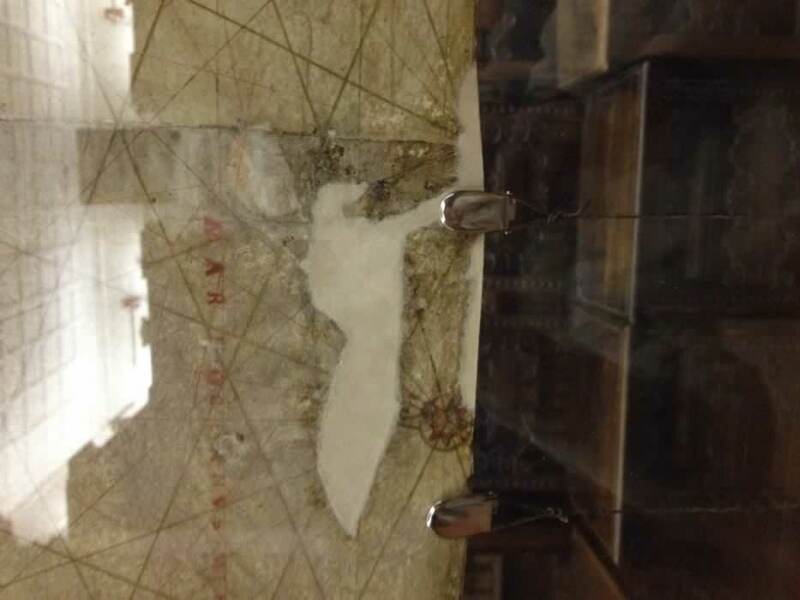 I have commenced with an overlay Cantino/Caverio plot using Florida/Cuba and the western end of the north coast of South America as alignment points. The profiles on both charts are perhaps similar but must not be construed as copies. However what they do indicate is an amorphous Hispaniola which in reality has little resemblance to the geographical. Then the island of Cuba is shown with what some researchers have decided is an island grafted to its northwest extremity. As yet I have to be convinced this is fact! 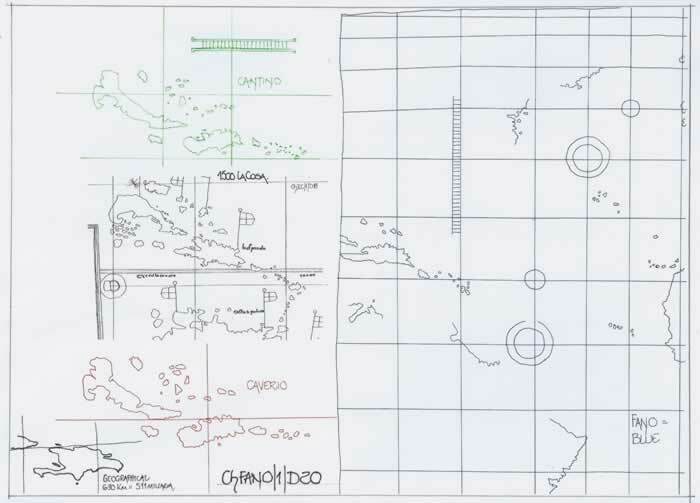 But if you study diagram ChFANO/D20 which has the FANO chart section drawn correctly with the 1500LaCosa chart West Indies section set alongside, the island of Hispaniola is drawn reasonably correctly on both and thus they are to be considered an attempt at the geographical and it was perhaps seen originally on a chart similar to the 1500La Cosa and is thus far better presented than either Cantino or Caverio. 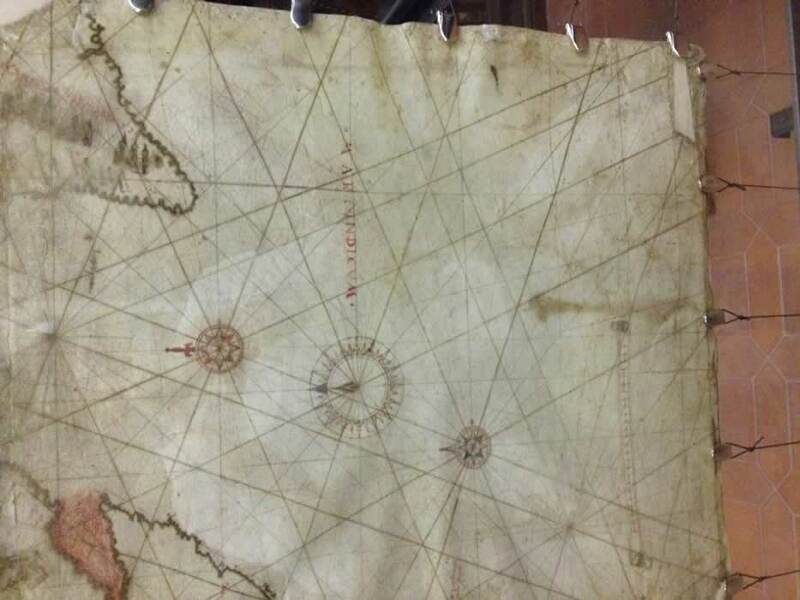 Thus I opine that previous researchers who have timidly commented on the possibility of other charts being available should in fact state clearly if they believe that fact that there were obviously more charts and if that is what they believe they had a great effect upon all charts following the Cantino Planisphere of 1502AD. By so doing perhaps a greater effort will be made to uncover the missing charts even if it is only by text reference. It is not in doubt that the FANO chart has been severely cut down on at least three sides, but the eastern edge may or may not have been reduced significantly. The only raison d’être for its being reduced on the eastern side is the unsupported idea that it is akin to the Cantino Planisphere in its geographical portrayal. However, faint as it may be it is possible that the east coast of the Indian Sub-continent may continue and perhaps portray a similar outline for the Malay Peninsula. There is however no proof whatsoever of this similarity. 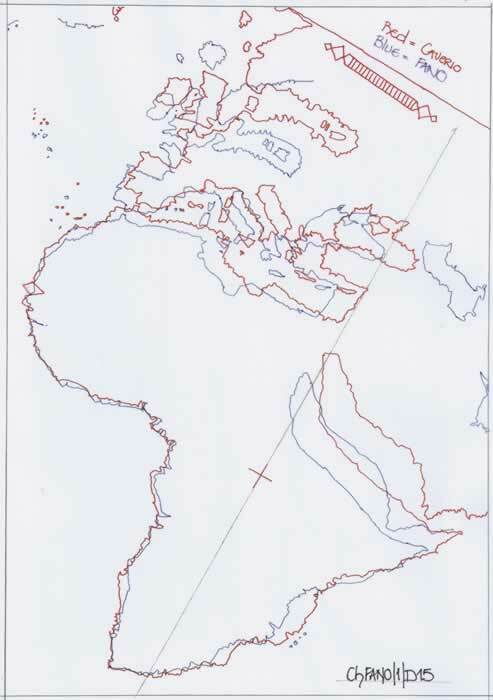 Why then is the “attribution” text squashed into the South American continent when the northeast and southeast quadrants, even in the reduced state could provide more than adequate space for a suitably inscribed attribution text, a text written by a proud draughtsperson as with many other charts. Firstly I am not a student of medieval hand writing, particularly this form of script and I merely observe that which is before me and thus question what this chart indicates. The script using capital letters varies across the chart with some excellent printed words which are aligned and others which wander considerably. Letter spacing is problematic in some headings, but taken overall the upper case headings are well scripted. The attribution panel is lower case, but starts with a grandiose size “EGO” and then “vesconte de” and a rather unfortunate “maiollo”. Being lower case using an upper case first letter for the surname would not normally be a problem except the “m” which is similar to the upper case “M” elsewhere on the chart is drawn lower case size. Studying the script we then observe that the letters “aio” are very small compared to the rest of the script and are followed by two “ll’s” where the second “l” was obviously added after an attempt to write the letter “o” and probably spell the surname “maiolo”. Thus we nearly read “maiololo”. All in all the surname “maiollo” appears to have been squashed into the space between “de” and “conpuxuy” which in comparison is a very large written word. 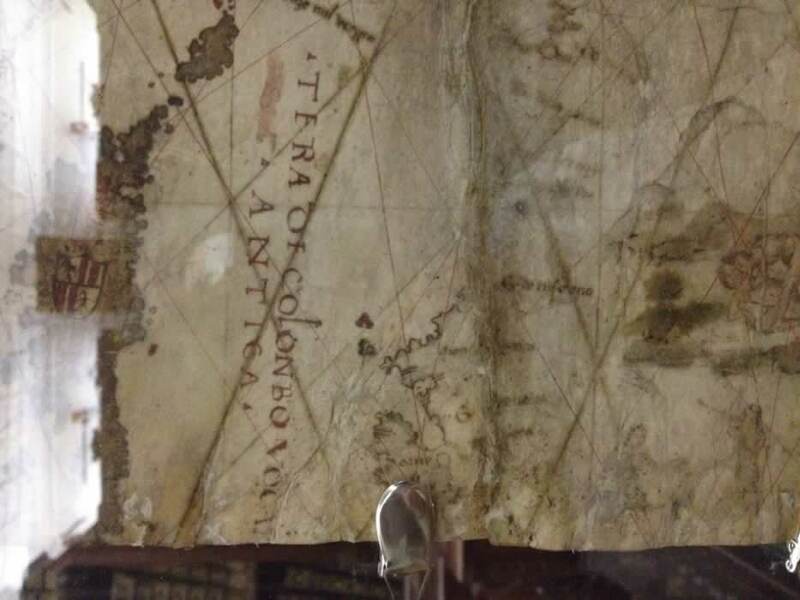 The fact that it appears it may have been “maiolo” a possible variant does not answer the question as to why the scribe did not know how to spell the surname properly and that it is completely subordinate to the given name, “vesconte de” and “conpoxuy” in the text. It is not a proud draughtspersons notation! Then the fact that the dots between the numbers of the “date” have been removed only serves to heighten my suspicion that this attribution has been altered, perhaps twice, the first being from elsewhere on the chart and thus could be a late addition. Thus, why is “Janua” the name of the “civitatum” written in a totally different script and obviously by a different scribe? It appears to me that both the surname and the city are additions into a hurriedly prepared attribution panel, and probably added quickly at different times. Returning to the “date”, •1 5 4•, with the two inner dots erased leads me to believe this chart was being recycled perhaps when the “Maggiolo” clan was being paid by the City of Genoa and it is passed off as a new chart and not drawn prior to the initial appointment. This subject and the obvious dating problems for the “Maggiolo” clan is to be explored in a later text, but it does seem strange that Vesconte de Maiollo is c30 years old when this chart is drawn. Thus my conclusion paragraph is written explaining my thoughts on this chart, but with obviously no more evidence than a perception born from the researches carried out. 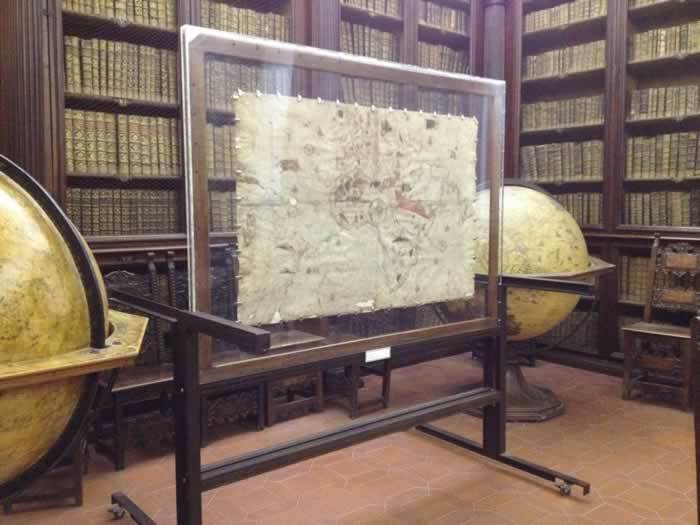 The chart held in the Biblioteca Comunale Federiciana, Fano, is a well drawn and decorated example of the genre. If this is the first chart by Vesconte de Maiollo then I assume he practiced and learnt his art and trade from a Master’s atelier. It should not have fallen into the hands of an imbecile who requiring a parchment tried to wash the chart off, but it did! 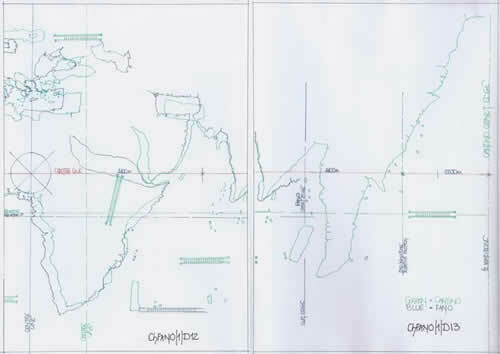 The fact that it lacks clarity in the portrayal of South America and is highly suspect in the portrayal of the Indian Ocean could actually indicate that it was a long term project and the sections were drawn as information arrived rather than a single operation and thus the chart could in fact be a work spread over several years. Thus the chart could date from 1498 to 1504 which would put Vesconte de Maiollo c25 years of age at its inception and hence a more likely age to complete a chart after training. But as usual there are a myriad of possible explanations. The FANO chart gives the impression of being unfinished in the east and of aged data in the west. Is this chart therefore a working model, a template which can be redrawn very successfully for the European/African central section and updated as required for the latest data which was no doubt arriving frequently as the explorations of both the east and west progressed? 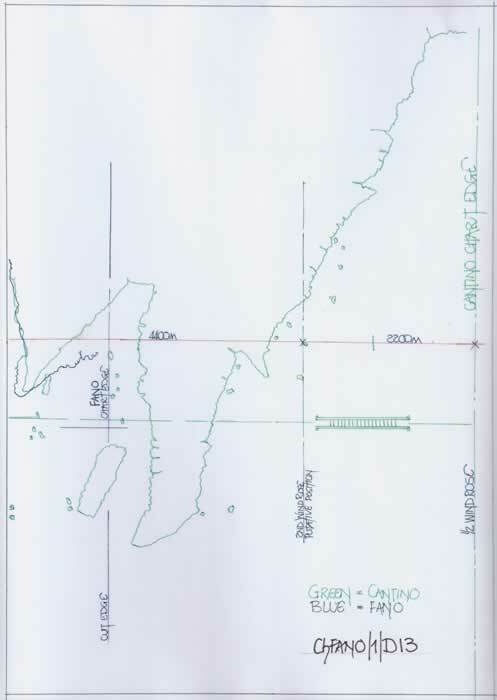 If you are a cartographer/draughtsman firstly you require a template to hold your design and information, but if it can serve the purpose also of being a show piece to possible clients whom may be interested in investing in a planisphere, an up to date chart, then you serve two purposes with a single item. 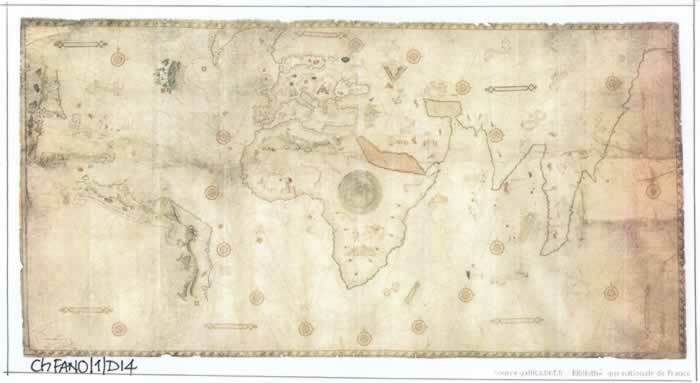 I cannot find a reason for the lack of detail in the Indian Ocean in 1504, nor for the discontinuous coastline of South America, when in 1504 it was well known and even the Cantino Planisphere has that coastline appended. Thus I opine that this chart is of an earlier date than appended, (if it is in fact correct) and that Vesconte de Maiollo had already drawn a far more detailed and up to date chart using this as his template and sales pitch and it survived because it was used for most of his career and perhaps was used by his brothers and sons in their endeavours. No proof whatsoever, but the chart just does not feel correct in its presentation. 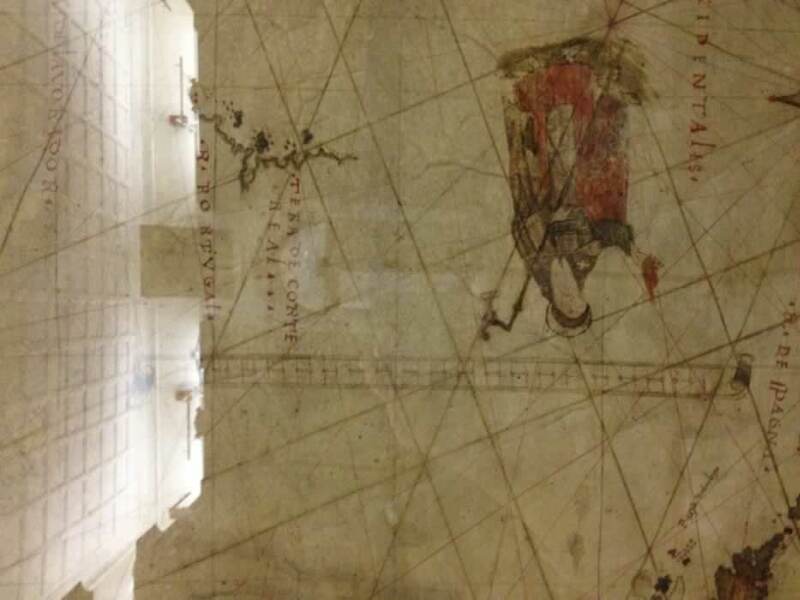 One of the great aids to my research was provided by the Biblioteca Comunale Federiciana courtesy of the librarians who to indicate a response to my queries took a set of photos of the chart regarding the wind rose and its surroundings. 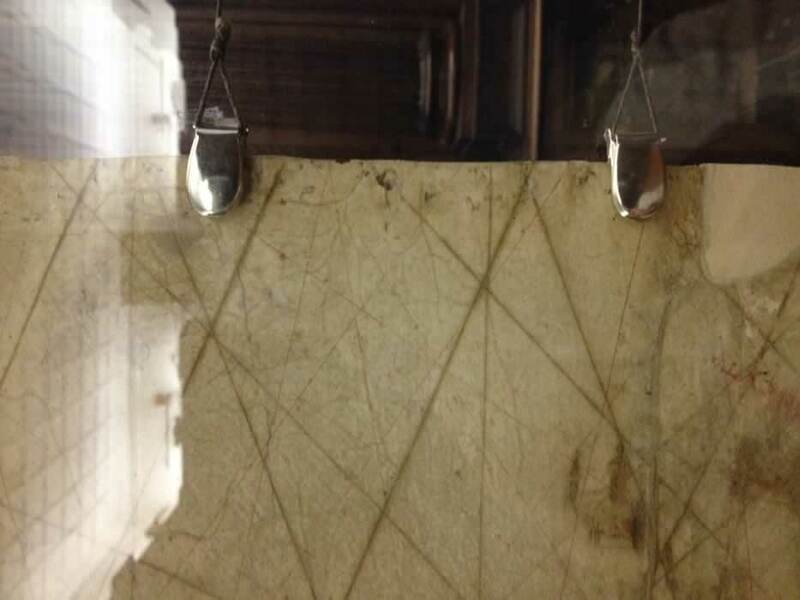 There are 26 photos and it is a pleasure to share them here to aid any other researcher who may wish to forensically examine the chart in a similar manner to confirm or argue against my findings. 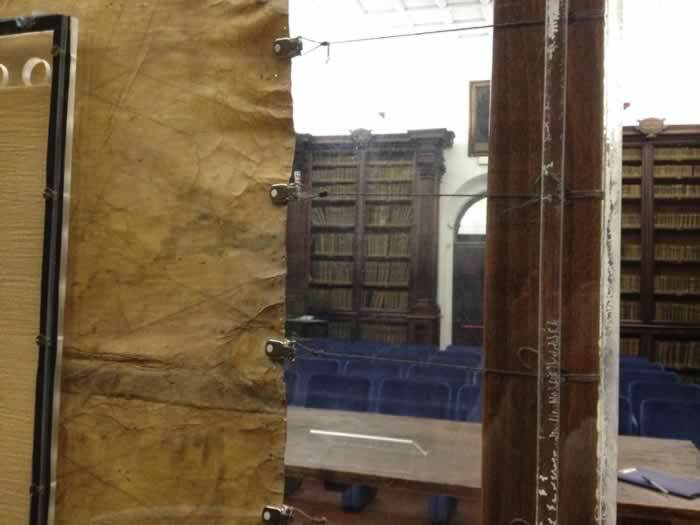 Biblioteca Comunale Federiciana; Via Castruccio Castracene, 1. Michael J Ferrar May 2018.